I still have a complete setup in chrome if you would like it. Missing 1 tab on each black bezel but they still mount up fine. Comes with aftermarket light capsules, relay and bulb harness and a headlight switch in gray or black. Along with all the mediocre technical support from me that you need to install them!! Of if you just want the bezels $170 and I will use the other stuff for the black bezel purchase. Can I see the tab that's missing? I had asked the gentleman I use for Holden parts To get me a price on them. Waiting to hear back. Sure, pic from the thread Using a freight forwarder. The black bezels attach in 6 places so one being broken does not effect it all that much. Those tabs are so darn fragile anyways I foresee in the future we will have to come up with a way to mount the bezels mechanically as the tabs break with age. No Moa, disregard the relay harness as I just realized you have a 14. I have not developed a harness yet to use for the 2014 fuse box that is different from the 11-13. KrabyKarl got it to work on his 14 but I am unsure how much hassle he had to go through to make it work. Have not figured out the switch either on the 14 plus. Have some ideas but have not tested them. But if you want just the bezels be glad to sell them to you. Price correction $150 for the pair. Well the tabs on the chrome part dont hold anything just guides. the black ones do the holding. Holds in 6 spots and there are 2 clips that do most of the holding and those are OK. But if concerned no problem. Wait around after this group buy for the black ones, some folks will be putting thier chromes ones up or sale I betcha. 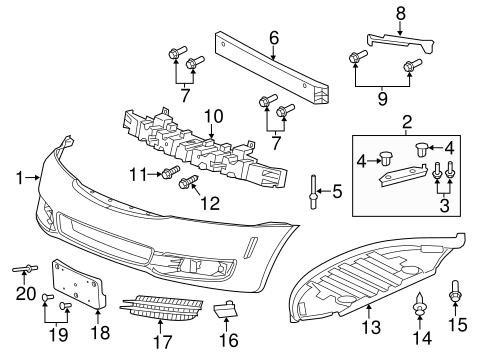 If anyone added fog lights and would not mind selling their original, non-fog light left bumper cover insert (number 17 shown below), I'd like to buy it. Please let me know.